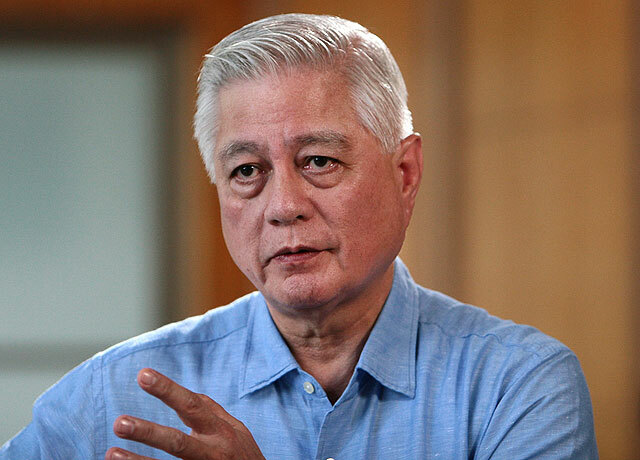 Former Interior Secretary Rafael Moreno Alunan III, on Saturday, reacts on former Davao City Vice Mayor Paolo Duterte’s earlier leakage on the alleged existence of an ‘Opposition Network’ seeking to unseat his father, President Rodrigo Duterte from office and destabilize the administration. 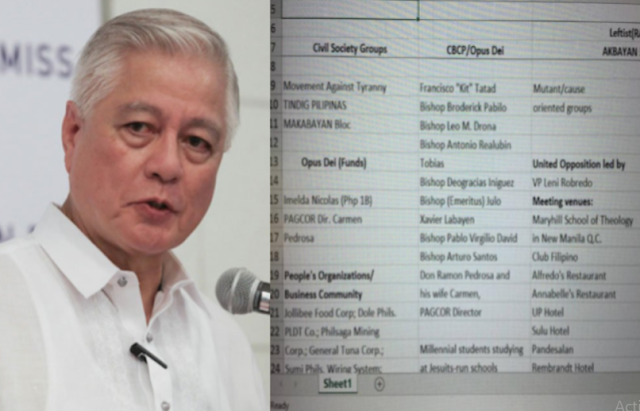 Alunan, in his Facebook post, announced in all ALL CAPS, urging entities behind the valuable information that Paolo possessed must ‘revalidate’ such facts since it included names of de*d and non – essential people. 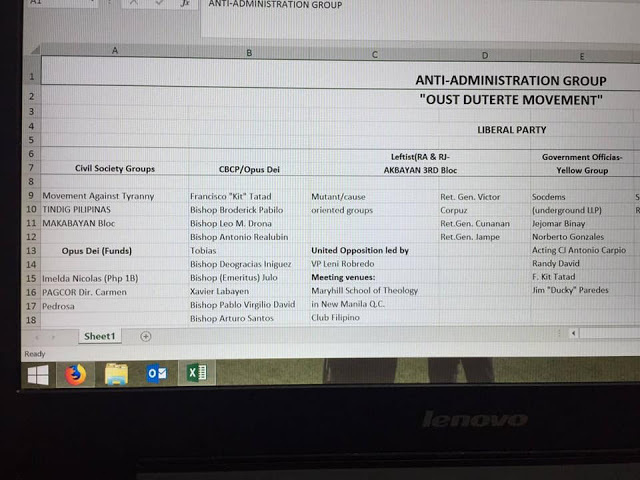 Paolo “Pulong” earlier posted on his Facebook page a copy of the list, entitled “ANTI – ADMINISTRATION GROUP, OUST DUTERTE MOVEMENT”, with a short caption that said, “Gisend ra ni sa akoa ha... Share lang nako kay para bibo...” (This was only given to me, I’d like to share this for FUN). Among those included in the ‘list’ are prominent government officials, Catholic prelates, business moguls, military officials and even “Millennial students studying at Jesuit-run schools”. “Sa ibang bansa sa rehiyon, at sa mga advanced countries sa europa at north america, ang kanilang internal security act will allow for preventive detention para ligtas ang human right ng kanilang mga lipunan to live in peace, safety and security,” he added. Many of Alunan’s followers found his post relatively credible as majority of whom, if not all, including Alunan himself are one of the President’s detractors. 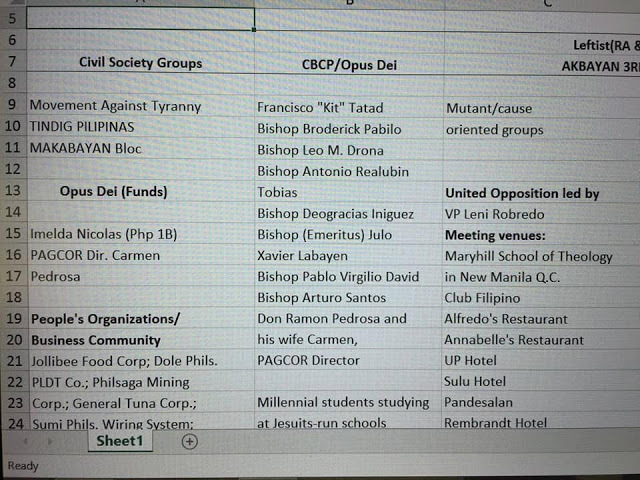 From a grandiose conspiracy involving groups critical of the Duterte regime — from the Communist Party of the Philippines (CPP), the Liberal Party (LP) and Magdalo group, to broad left - leaning coalitions like the Movement Against Tyranny, Coalition for Justice, and Tindig Pilipinas — the Armed Forces of the Philippines have also previously expanded the plot that included 18 colleges and universities in NCR whose students are supposedly being indoctrinated by communists through films about martial law. 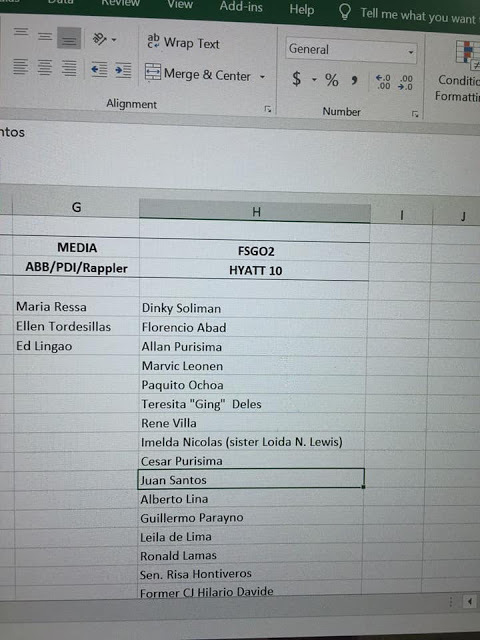 Casiño maintains that no proof or evidence was ever presented of the conspiracy, save for the usual “intelligence reports” and “computer files” that were all confidential and never shown to the public.